In addition to making cleanup a breeze, grilling these pizzas on the barbecue adds irresistible smoky flavour. Reserve 2 Tbsp. barbecue sauce for later use; brush remaining barbecue sauce onto chicken. Grill 6 to 8 min. on each side or until done (165ºF). Remove chicken from barbecue. Let stand 5 min. Cut chicken into thin slices. 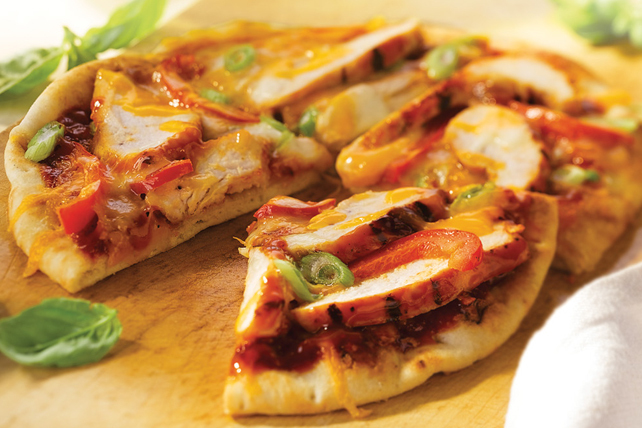 Mix pizza sauce and reserved barbecue sauce until blended; spread onto flatbreads. Top with chicken, peppers, cheese and onions. Grill 5 min. or until cheese is melted and bottoms of pizzas are lightly toasted. Prepare using your favourite variety of Cracker Barrel Shredded Cheese, such as Old Cheddar, Mozza-Cheddar or 4 Cheese Italiano. Garnish pizzas with small fresh basil leaves before serving. Prepare using a combination of different-coloured pepper strips.